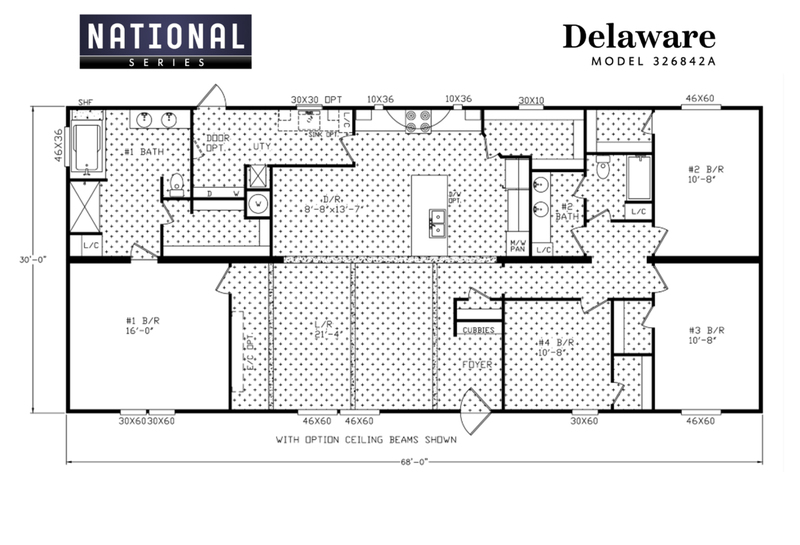 The Delaware is a remarkably impressive home, with more than 2,000 square feet of stylish space. It starts with a massive living room with a built-in entertainment center (optional) and clear sight lines into the dining room and kitchen. The living room also comes with optional exposed wood beams to give the home a rustic, country farmhouse feel. The kitchen features a large center island, double sink, pantry and plenty of cabinet space. There is a separate dining room area with enough room for a large table. There is also a cubby area in the foyer with extra storage for shoes, jackets, and anything else. The master suite is one of the home’s best features, with a massive bedroom and relaxing bathroom. The master bathroom has a large soaker tub, dual vanity countertop, walk-in shower and walk-in closet. The remaining three bedrooms are located on the other side of the home, meaning the master suite has maximum privacy. Those three bedrooms share a well-designed hallway bathroom, with a dual vanity sink area separate from the bathtub/shower and toilet. In addition to all these rooms, there is also an utility room with washer/dryer hookup and storage space. The Delaware is a great home for people who love living in a house that is both spacious and stylish in the areas that matter most.